The 2014 Jeep Cherokee Review: The Jeep Cherokee name goes back to 1974, but it became a pioneer in the SUV market in 1984, when the second generation offered rugged Jeep characteristics in a more comfortable package. It was one of the main reasons that Chrysler bought Jeep back in 1987. The Cherokee was always styled after its esteemed forbear, the WWII basic Jeep. That meant a no-nonsense, squared-off profile. When the powers-that-be opted for a softer new design years ago, they renamed it the Liberty. Now, the Cherokee is back. But what is it? Well, there are still seven slats in the grille, but it’s a much softer, rounder nose than you might be accustomed to. And look at those slim “eyes” at the top. They are not the headlamps, although they could accommodate today’s tiny, powerful bulbs. They are the parking lamps, and the real headlamps are below. There are squared off wheel wells, but otherwise it’s a whole new world. Inside is a clean, organic-looking layout. Jeep has moved far beyond its original flat metal panel with circular gauges. Now, in Vesuvio, Jeep Brown/Indigo Blue, it’s a fashion statement. Note: The other two interior color schemes are Morocco black and Iceland black and light gray. The panels meet in interesting and designer-approved ways, and the door panels feature a rising hill design that looks just like the kind you’d love to climb. My Billet Silver Metallic Clear Coat test car was a Limited, so it was fully stocked. Leather seats and shift knob, heated steering wheel, and much more make this car anything but a rough rider. Loads of options, divided into Technology and Luxury packages and other single items make this Cherokee more of downsized Grand Cherokee rather than an upsized Wrangler. 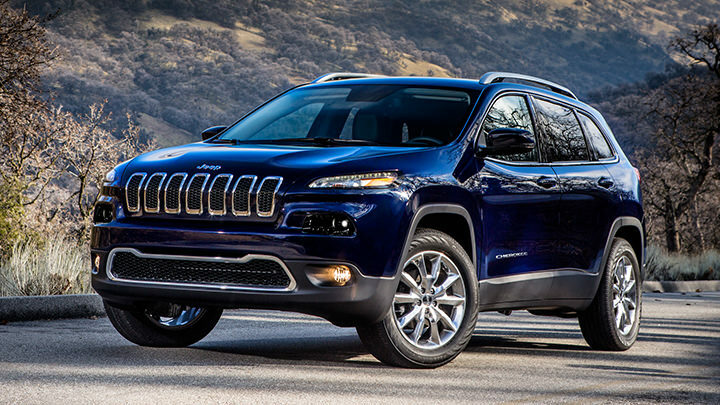 This all-new Cherokee is based on the Italian chassis that also underpins the new Dodge Dart, but it’s still built in Toledo, Ohio, just as Jeeps have been for practically forever. Two engines are offered. The Tigershark MultiAir2 2.4-liter four-cylinder is from the Italian side of the family. It puts out 184 horsepower and 171 lb.-ft. of torque. The larger engine, the new Pentastar 3.2-liter V6, is a smaller version of the popular and well regarded 3.6-liter V6 from the American side. Its 271 horsepower and 239 lb.-ft. of torque made my tester feel strong out on the road. This car introduces a nine speed automatic transmission! You can’t hear much, but if you listen carefully and watch the tachometer you will notice lots of gear changes. This is meant to improve efficiency. Thankfully, it’s not a CVT continuously-variable type, so you can sense up- and down-shifts. Fuel economy is improved by as much as 45 percent versus the old Liberty four-cylinder it replaced. The EPA gives it 21 City, 28 Highway and 24 overall. The V6, with its extra power, earns 19 City, 27 Highway and 22 overall. I averaged 22.5 mpg during my enjoyable test week. You can get the three on-road levels of Cherokee, Sport, Latitude and Limited, in a four- or two-wheel-drive configuration. My tester had the kind of 4x4 capability that you need for casual offroad driving, and you control it by dialing it in on the center console. The Selec-Terrain system offers Snow, Sand/Mud, Sport or Auto settings. I left it in Auto, where you’d want it in normal driving. For more adventurous motoring, Jeep offers the Trail-Rated Trailhawk model, based on the midlevel Latitude. You get off-road wheel flares, tow hooks, skid plates, an off-road suspension, heavy-duty engine cooling, and auxiliary transmission oil cooler. In addition to riding an inch higher (to 8.7 inches of ground clearance), it uses the Jeep Active Drive Lock 4/4 system with low range and locking rear axle, and Selec-Speed Control with Hill-ascent and Hill-descent control. The Trailhawk features plenty of special badging and appliqués. The interior gets its share of exclusive elements, predominantly in red. And, the Trailhawk wears different front and rear fascias, for a more aggressive approach angle of 29.8 degrees while climbing rocks. A 4x2 Sport with nothing extra starts at $23,990, including a $995 destination charge. The Limited picks up at $30,990; mine came to $37,030 with its long list of upgrades. The Trailhawk starts $500 below the Limited, with the volume-selling Latitude in the middle range starting at $27,490. The Bottom Line: This new 2014 Jeep Cherokee strays far from the original and traditional look, as Jeep wants increased international sales, and to bring the brand into the future. But Jeep knows it has a special reputation and history to protect. Now in all new Jeeps the steering wheel wears “Since 1941” pressed into its lower rim, to remind everyone where it came from. Column Name: The Jeep Cherokee is back!